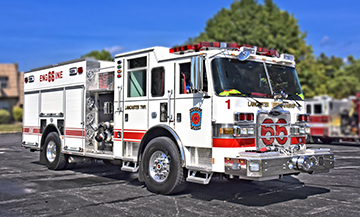 Lancaster Township Fire Department took delivery of a new Pierce Arrow XT Heavy Duty Rescue/Engine on April 3, 2018 from Pierce Manufacturing of Appleton. Wisconson. It was placed into service June 3, 2018 at 6:10 p.m. The cab has seating for 6 firefighters and a 10” raised roof. The unit features a Hale 2000 GPM single stage pump, 750-gallon water tank and three Crosslays. There are four Hydraulic Reels for pre-connected rescue tools. Two are placed inside a driver side compartment and two inside the front 26” extended bumper to supply two pre-connected Amkus hydraulic rescue tools. The color scheme of the new rescue rescue engine matches the 2015 Pierce Arrow XT Engine 66-1 which is white with red lettering and striping. 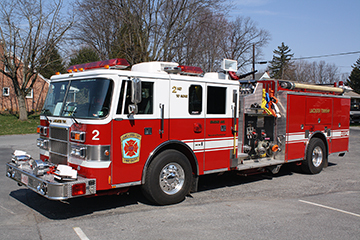 The sale of their 2006 rescue unit to New Brighton borough, PA in August of 2016 made it possible for LTFD to consolidate apparatus functions from two units, into one rescue-pumper and downsize their fleet. When the new rescue/engine arrived, the current Engine 66-2, a 1993 Pierce Lance engine was placed out of service and sold. 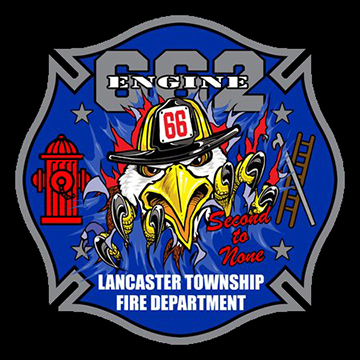 Lancaster Township Board of Supervisors approved the purchase of the new rescue engine at their March 13, 2017 Board of Supervisors meeting. 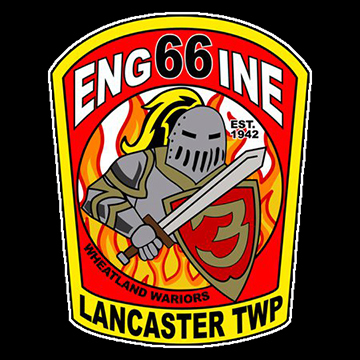 Engine 66-1 is a new custom built engine from Pierce Manufacturing arriving in Lancaster Township March 13, 2015. The new engine is a Pierce Arrow XT, outfitted with a 10-inch raised roof cab and seating for six firefighters. 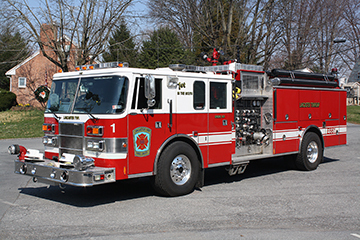 This is the first brand new unit purchased by Lancaster Township Fire Department since 1998. The new engine was placed into service in early May after equipment mounting and training. It ran it’s first structure fire on July 30. The first fire was a 2 alarm building fire in Sterling Place where firefighters rescued a dog from the burning building. The new engine replaced Engine 66-3, a 1992 Spartan/American La France engine which was sold. Engine 66-2, a 1995 Pierce Lance, which was housed in the South Station in the village of Bausman, was moved to the North Station in Hamilton Park. Cummins ISL 450HP engine with Jake Brake, Allison EVS 3000 transmission with aggressive down shift mode, OnSpot tire chains, A/C, aluminum pumper body, high side compartments both sides, hatch compartments, 750-Gallon FDNY style water tank, Hale QMAX 2000gpm single stage pump, front bumper 2.50” discharge, two (2) 1.75” crosslays, three (3) rear 2.50” discharges, one (1) 3.00” Deluge W/TFT Hurricane, model XFIH-E remote controlled monitor, booster reel with 200’ of 1.00” hose, Whelen LED warning light package, Mars 888 front warning light, Q2B & Sho-Me electronic sirens, 10KW Harrison hydraulic generator, one (1) Whelen 12-Volt PFP2 LED visor light, four (4) Whelen 120-Volt PCP2 LED recessed lights, and one (1) cord reel with 200’ of 10/3 cable with junction box. Purchased in December 2000, Engine 66-2 is a 1993 Pierce Lance 4-door pumper with seating for six. Powered by a Detroit Diesel 8V92TA 450 HP DDEC engine with Jacobs engine brake and an Allison HT-740 4-speed automatic transmission. Engine 2 is equipped with a Waterous 2000 GPM 2-stage pump, 1000 gallon water tank and front suction. This engine is outfitted with 1,200 feet of 5" supply hose, crosslays from 1 3/4" to 2 1/2", a pre-connected TFT Blitzfire step gun, a pre-piped TFT Crossfire deck gun, extended length "apartment" attack line, both Class A and AFFF foam, TFT Foam Jet, TFT Pro/Pak portable foam system and traditional engine company tools. This unit is also equipped with a 7.5 kW liquid cooled Onan generator, electric rewind cord reel with junction box and 4000 watts of quartz lights. Engine 66-3 is a 1995 Pierce Lance with seating for 9 personnel, it has a Series 60 Detroit engine and a Allison world transmission. It has a 1500 GPM topmount Hale pump, and has 640 gallons of water. This engine is extensively equipped for structural fires to include crosslays from 1 3/4" to 2 1/2 ", a pre-connected step gun, pre-piped "extend-a-gun" deluge nozzle, extended length "apartment" attack line, and large quantities of spare hose. This unit is also equipped with a 7.5 kW liquid cooled generator and 7000 watts of quartz lights. LTFD replaced their 1998 Spartan/LTI 93’ midmount tower ladder with a 2016 Seagrave 95’ Aerialscope Non-Quint Platform. The Aerialscope was purchased from Falls Township Fire Department in Bucks County, PA who acquired it new from Seagrave Fire Apparatus in 2016.